So you're jetting off to a tropical island in uncharted waters. But how are you supposed to enjoy paradise when copyright laws put the international hammer down on Netflix? Winter travelers, meet your new best friends: Proxy and VPN services. Watching geographically restricted content can be tricky. 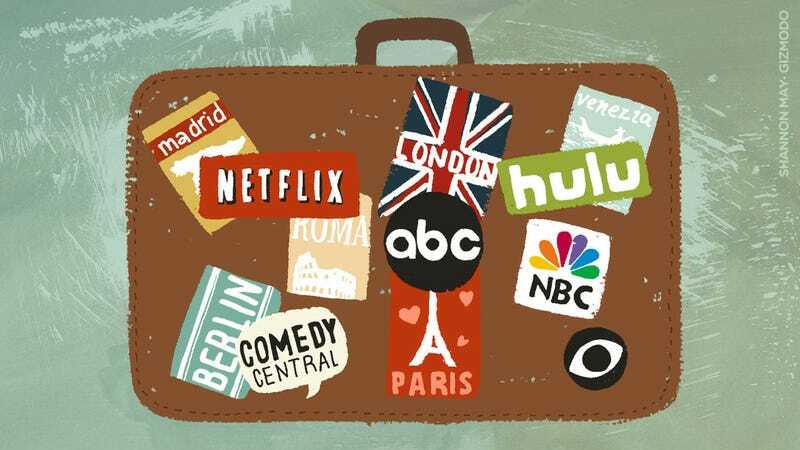 Streaming services like Hulu and Netflix (as well as other network sites) employ geotracking software to make sure nobody outside of the US can dip in to watch The Office or Exit Through the Gift Shop. And it's not just Americans who have this problem: Foreigners traveling to the US can't watch their obscure racing leagues and alternative ball sports. It's lame, really. But don't fret. There are fairly quick ways to get around these pesky barriers—namely, by using either a proxy or VPN service. Both of these options reroute your computer's network connection and change your IP address to make it look like it's coming from somewhere else—like, say, the US. They work in slightly different ways. Think of the proxy server as a kind of browser-based filter. In simple terms, it sends your traffic through another IP address that is located somewhere else. Then, when you fire up Firefox, Internet Explorer, or Chrome, web pages are routed to you via the proxy server with whatever benefits are associated with it—security, speed, geographic location etc. VPN ( which stands for Virtual Private Network), on the other hand, actually encrypts and reroutes all of your Internet access, effectively replacing your local ISP. We'll go over both options for the expat or jetsetter jonsin' for his home-cooked entertainment. Netflix, Hulu, and sites like ABC.com look at your IP address to determine where in the world you're browsing from. But fooling them isn't all that hard. If you want a quick and easy way to bypass these annoying roadblocks, you can sign up for a proxy service like IP Hider. There's a free trial version of the software you can try, although it's PC-only. If you use Firefox, it'll provide an easy way to change your settings so that once you have IP Hider up and running, you can appear to be anywhere on the connected planet. What it is: Software that redirects your Internet traffic through anonymous servers. What you'll need: A PC, an internet connection, and strong yearning to watch geographically-restricted content. What it costs: Nothing! All you need is the trial version of IP Hider and you're ready to rock. • Download the free trial of IP Hider; install it on your PC. • Click on the country you want to change your IP address to (might we suggest the United States?). Click the 'Check IP button. • If it doesn't work (or the connection is super slow), click the 'choose next' box to switch a (hopefully) a faster proxy connection. • Browse the ole WWW and watch videos as you normally would. Going with a VPN service is another way to access your favorite content back home. It's also the most general-purpose way to view video content that has been restricted online. For one thing, proxies that support video must be custom coded to support each site so, for the most part, only the biggest sites will work. Unlike a proxy, a VPN will grant you a secured connection for all the programs you use, whether it's ICQ, email, or anything else. The only downside is that you usually have to pay for it if you want any kind of decent speed. What it is: Essentially, a second ISP. Like a proxy, you get a new IP address to show the world. What you'll need: Again, an Internet-connected computer is your ticket. What it costs: Free versions limit you to crappy bandwidth. A good, publicly accessible VPN will cost around $10/month. • First, choose a reliable (and well-established) VPN service. We like StrongVPN or HideMyAss Pro. The former offers accounts from $7/month, while the latter will cost you $11.50/month. You'll get better deals if you opt for longer time periods. Both are Mac, PC and Linux compatible. • Choose your time length and sign up for service. • On a Mac, open up your System Preferences. Click on Network. • Click the ‘+' button to add a VPN (PPTP) connection. • Almost done. Next, go to Network Preferences and click the advanced button. Select Session Options and check the "Send all traffic over VPN connection" checkbox. • You can check the speed of the VPN servers here. A quick note: Just because we showed you how to do this, doesn't mean we endorse it. Please consider this guide a useful thought exercise—and nothing more. Original illustration by Gizmodo guest artist Shannon May. Check out more of her work on her website.